Why is a football player, actor, coach, on the SANTA FE GHOST AND HISTORY TOURS WEBSITE... Because JOE KAPP was born here in SANTA FE and is a true historic figure, who besides his athletic prowess brought free agency into football and stood by his honor and beliefs just like BILLY THE KID did, who is another SANTA FEAN... Both BILLY and JOE fought the corrupt power brokers and did not besmirch their honor no matter how impossible things looked. Joe fought the NFL bosses for FREE AGENCY and BILLY fought the SANTA FE RING.... SO here is Joe's story and I am happy to say that JOE and I are Pals. Joseph Robert Kapp was born in Santa Fe, New Mexico, he now lives in Los Gatos, California. His mother was Latina (Garcia) and his father was of German heritage (Kapp). Joe played college football for CAL (University of California - Berkley), in his senior year he led the Golden Bears to the 1959 Rose Bowl. It is of note the Bears have not been back to the Rose Bowl since Joe was their QB. Upon graduation, Joe who led the nation in offense was not selected by the NFL. Hispanic prejudice by way of NFL owners and scouts had a hand in Joe not being drafted. Joe was a proud Chicano, which is a term that means a man of Spanish or Mexican Heritage. Joe was not ashamed of his Latin Southwest heritage. The CFL (Canadian Football League), unlike the NFL of that era had no qualms of having a Latino play quarterback for one of its league's teams. The Canadians had the idea, that it did not matter what a man's DNA was, in the Canadian football league all that mattered was a man's performance on the field of play. Joe went to Canada and became a starting quarterback for the Calgary Stampeders and BC LIONS. Joe led his teams to 3 different CFL championship games, losing two and winning one. 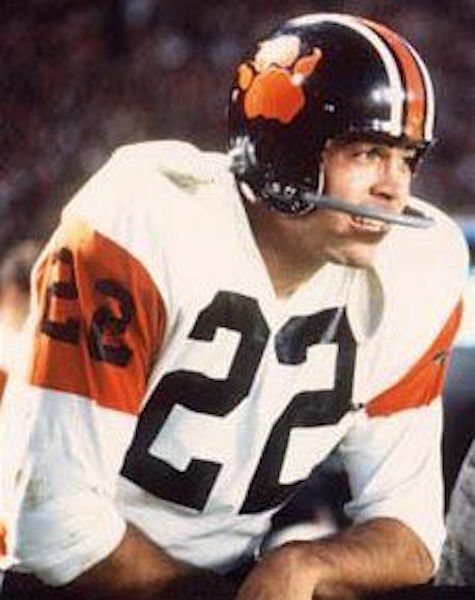 His (British Columbia Lions) BC LIONS team won the 1964 championship. Joe's leadership and tough play, he did not shy away from physical contact, finally got himself noticed by NFL scouts and coaches. 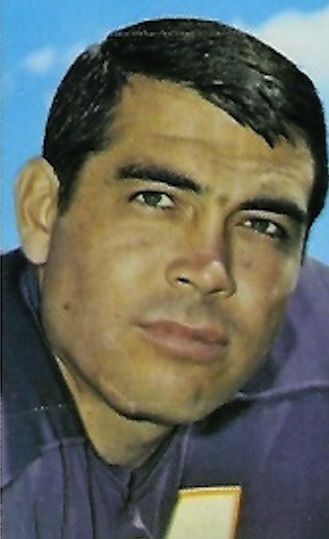 The woeful Minnesota Vikings signed Joe to their team in 1967. By way of his inspirational physical play and leadership, Joe turned the Vikings into a perennial NFL powerhouse. Many nicknames were attached to Joe, due to his fiery play and his style of "follow me leadership". "INJUN JOE", "CHICANO JOE" and "ZORBA THE VIKING" or "ZORBA" were some of the monikers. Joe was not a slick quarterback who looked good on the field bossing players and then wimping out when there was contact. Joe's style of play was never pretty it was rugged. The passion for the game that Joe had and how he played the game rubbed off on his teammates. 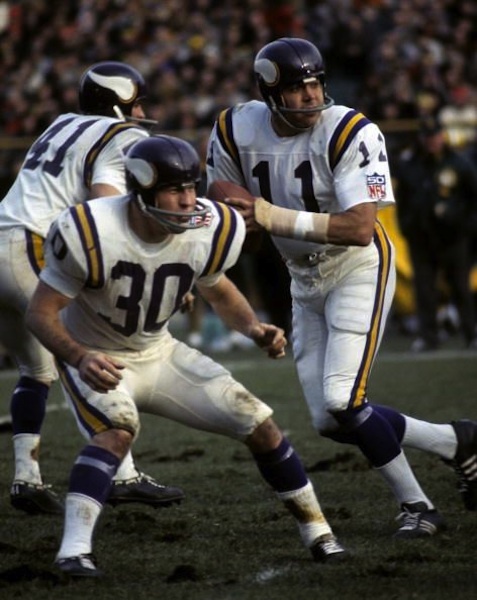 The Vikings offense and defense, due to Joe's example, became squads that gave %100 and were physical to the extreme. When Joe threw an interception, he did not move away from the contact that followed. Unlike other modern day quarterbacks, Joe ran downfield looking for a linebacker to spear. Some sports commentators claimed that Joe was a linebacker playing quarterback. By osmosis the Latin machismo that Joe had got into the Viking team. The Vikings got the nickname the "PURPLE GANG" due to Joe's "Leave everything on the field", style of play. In 1969 Joe led the Vikings to their first Super Bowl. The Vikings did lose the Super Bowl game to coach Hank Stram's Kansas City Chiefs. But the Super Bowl defeat only brought the Viking team closer and made the "PURPLE GANG" hungrier for victory. With Joe's leadership, if there ever was a sure thing in sports, it was that the VIKINGS were going back to the Super Bowl. It was predicted by the NFL experts that the purple uniformed Vikings would win the big game and from that point on, the Norsemen were going to be a dynasty that would rule the NFL. But next year did not happen, months after the Viking's Super Bowl appearance, general manager Jim Finks, traded Joe to the Boston Patriots. Why would the winner of the MVP award (Most Valuable Player) get traded, and with the trade there goes the future of the Vikings? Because Joe would not put up with Fink's and Viking's the front office unfair contracts and their egotistical ways of running a team. G.M. 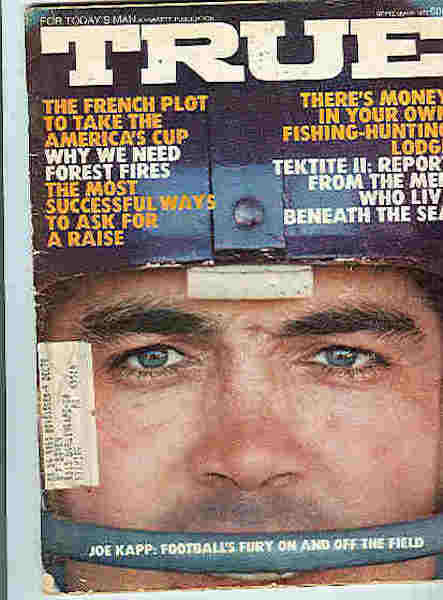 Finks was a vain ex-NFL quarterback who did not like being upstaged by Joe and was irritated by the rebellion that "THE CHICANO" brewed up over unfair contracts. Finks during his NFL days never could command a team in the manner of how Joe led the Vikings. Loyalty and toughness emanated from Joe and these qualities were infused into the Viking team. Joe's qualities were admired and hated by Fink's, who was a corporate man. Joe was fond of saying he was not one of the "Wall Streeters" and encouraged players to demand more money and fostered better relationships between the black and white players on the team. 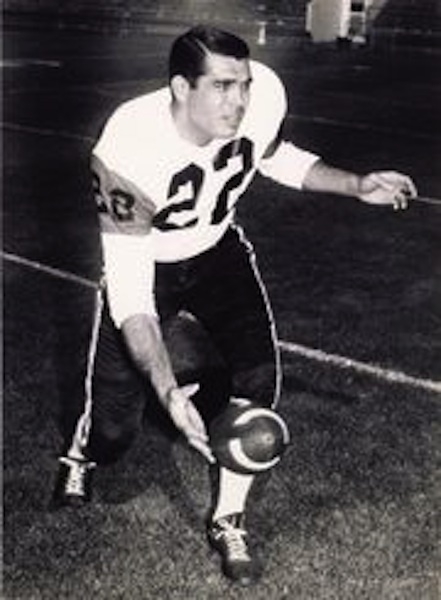 Finks sent Joe to the then Boston Patriots, (today known as New England Patriots). Joe played out his contract of one year then become a free agent. The NFL owners in essence bellowed you can not do that (be a free agent) and locked Joe out of the league. Joe's actions were legal, he was free of his old contract and he had decided to play for a team that paid him big dollars. Or if Joe wanted to, he could play for a team that he got along with as in coaching staff, for less money, because it was his right as an employee to choose where he wanted to work. Joe now became a corporate outlaw who fought the establishment. The NFL barred him from playing so Joe went to court and contested the league for the right of free agency. This court battle dragged on, in 1976 the legal drama ended. Joe was victorious, but his career was now over. Joe had not played a down in 5 years, due to the owners locking him out of the NATIONAL FOOTBALL LEAGUE, but his actions led to the NFL adopting the Free Agency system. In the end, Joe had fought the NFL trust and had busted it. The days of the NFL mandating that there was no such thing as a free market was over. Joe was baseball's version of Kurt Flood, Sadly Joe is not given much credit for his fight against NFL Commissioner Pete Rozele's legal all star team. Like Billy the Kid, who fought corrupt lawmen and crooked politicos, Joe took on the powerful and at that time, dishonest NFL. Joe fought the league year after year in court until he won. By being branded an outlaw by the NFL, the league's lackey broadcasters and journalists did not let Joe get work in sports media. So Joe went onto a Hollywood film career and later coached football at Cal Berkley. What kind of guy is Joe, he is a fighter and an honest man. He will not be pushed around and the way he has conducted his life shows what kind of integrity the guy has. Joe is loyal to his friends and principles, the following videos demonstrate this Santa Fean's machismo, honor, and personality. BELOW: Joe's team the 1982 University of California Golden Bears are down to John Elway's Stanford team, with only seconds left on the game clock. This play shows how the Bears found a way to win. This play is a microcosm of how Joe played the game of football and how he went through life, giving %100 in effort. This game winning kickoff return has been labeled "THE PLAY" and only a Joe Kapp team could have pulled it off. Joe's motto at Cal was, "THE BEAR WONT QUIT, THE BEAR WON't DIE." 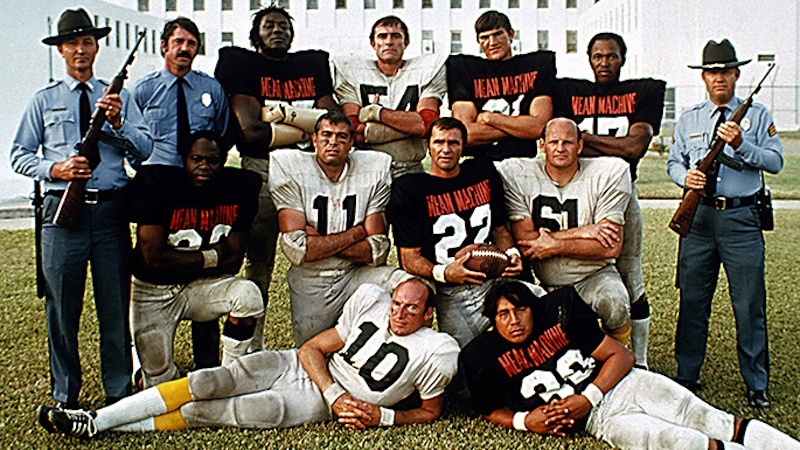 Below, Joe and the cast of the 1974 film "THE LONGEST YARD". Joe is #11, next to him, #22 is Burt Reynolds. Even as a older man, Joe is still a tough, honest guy who does not put up w/ garbage= click -below. Why the fight, its from a grudge of decades ago. Angelo Mosca took out Joe's teammate with a "DIRTY" play. Below is a short docu on Angelo Mosca, on the short film it shows the dirty hit on running back Willy Fleming who was on the ground when contact was made. This leg drag or knee to the back of the head gave Fleming a confusion and this put the running back out of the game. This illegal hit is what started the feud between Joe Kapp and Angelo Mosca. On the docu, Mosca who was known as the meanest player in the CFL, does not come across as a guy who followed the rules. Simply put, Mosca was a rough, tough dirty player. However, Joe Kapp cut him down to size, it took a few decades but there was some justice. Hee-hee-hee. Below: some justice after 49 years --- Joe Kapp settles the score. BELOW-- Joe in the NFL, you can see in these videos why the man is respected. This Santa Fean has MACHO! His leadership abilities are incredible, so were Billy the Kid's. Both Joe and Billy fought the corrupt powers in different ways--they never did bow the knee to the corrupt ruling elite. As for the paranormal--here is the story -- is it false or or is it the truth? When Joe was cast out of the VIKINGS by the organizations's front office, a curse was placed on the team. That is why the Vikings have not won a Super Bowl. But more on that story another time. So why is JOE KAPP on a SANTA FE GHOST AND HISTORY TOURS WEBSITE? 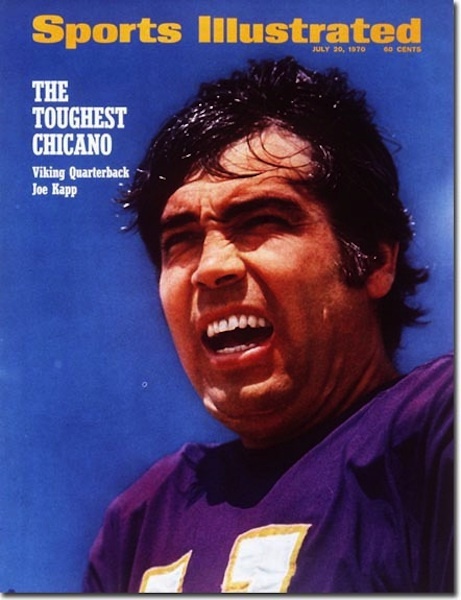 Because JOE KAPP is a historic SANTA FEAN, as in what he accomplished on and off the field is history. Joe in different ways, was as capable as BILLY THE KID another Santa Fean. Both Billy and Joe led from the front and were loved by their cohorts. The game BELOW sums up Joe Kapp's tenacity and leadership skills. Like Billy the Kid, Joe is able to rally his men, in this case his football team and get a victory against all odds... The ending of this 1982 Stanford vs. Cal football game is unbelievable.... 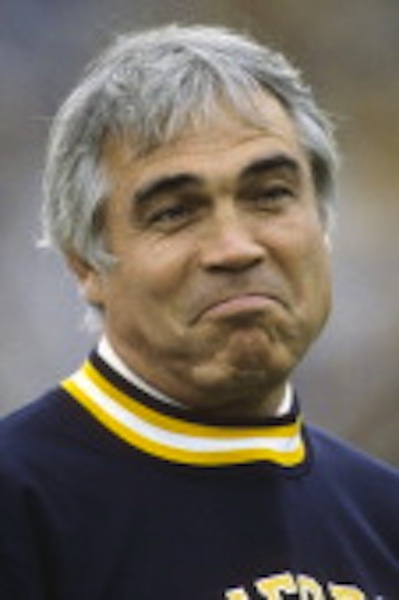 The Cal Bears were coached by Santa Fean Joe Kapp. BELOW: The abridged version -- the final few minutes of the game ---- More in depth than than the short video at mid page. 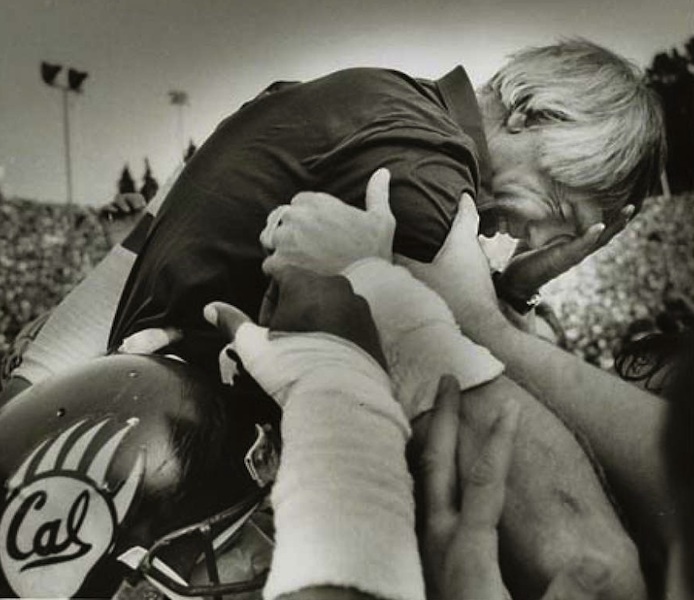 The energy that Joe Kapp brought to his teams was incredible, the 1982 Cal-Stanford game was a microcosm of Joe's willpower and leadership qualities.